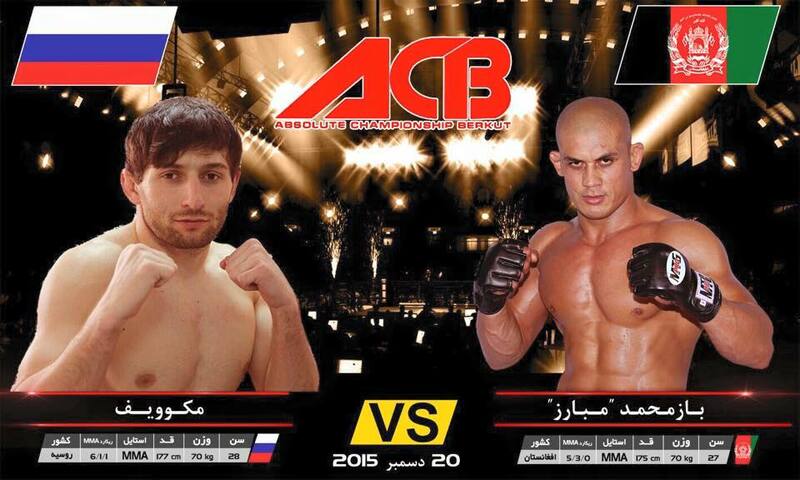 Afghan MMA (mixed martial arts) fighter Baz Mohammad Mubariz took on Russia’s Islam Makoev and lost in the first round via submission (standing rear naked choke) in a lightweight preliminary card bout in Tajikistan tonight as part Absolute Championship Berkut’s (ACB) 27 card. Mubariz came out strong and was doing well with some ground and pound action. However, towards the end of the round, he looked tired and Makoev was able to get his back and sink in the choke. With this loss, Mubariz’s record drops to 5 wins and 4 losses, and Makoev improves to 7 wins, 1 loss, and 1 draw. Twenty-five year old Mubariz started out as a top wrestler and later turned to MMA. His first professional fight and win was in India on November 9, 2012. Recently, he has grown very popular in Afghanistan. He has met and taken photos with 1st Vice President Abdul Rashid Dostum, and was even appointed as a goodwill ambassador for Afghanistan’s National Police Force. Despite losing tonight’s match, Mubariz is still young and has plenty of time to improve his skills. Many of his fans understand that it takes time to improve the skill sets needed to become a champion.